How is the Focusrite Scarlett 2i2 Second Generation Different from the First? First of all, 8 dB more headroom for instrument inputs. Significantly lower latency than was achieved with the First Generation model. Surge protection for inputs and outputs. More even gain structure for setting mic levels. With the old version, good settings were often near the end of the dial. Better converters that handle up to 192 kHz and 24 bit audio. Ships with Avid Pro Tools First and additional plugins, loops, and software. Much louder headphone amp than in the original. This might be one of the best reasons to upgrade. And finally, the Focusrite Scarlett 2i2 Second Generation has more clearly marked dials. Making the switch to New Scarlett Audio Interfaces. So, if you own a first-generation 2i2 or another Scarlett audio interface, I highly recommend you make the switch to the newer models. When buying, how can you be sure it’s the second-generation model? Focusrite has a handy guide to let you know. If the serial number starts with a V or W, it’s second-generation. If it starts with a S or T, it’s first-generation. 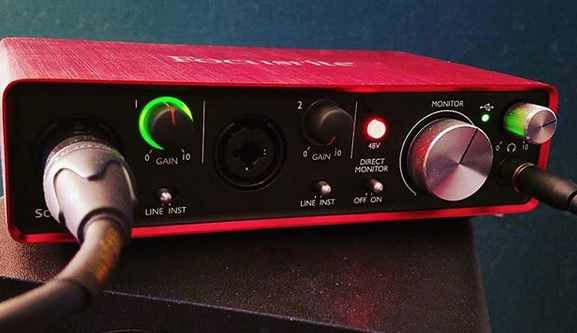 With all the amazing advances in voice over friendly audio interfaces over the past few years from almost all the popular brands like Universal Audio , Yamaha, Presonus, and RME, don’t settle for an old Focusrite interface. Make sure you choose the Focusrite Scarlett 2i2 Second Generation or other Scarlett Second Generation gear. I’m pleased to now offer to live directed sessions with Source Connect for voice over. Robert Marshall, Co-Founder of the Source Connect company, Source Elements, went above and beyond with a call to go through the set up, use, and features of this powerful ISDN replacement tool. 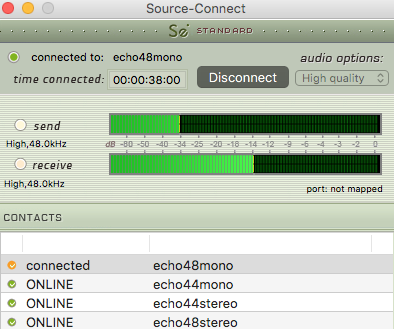 While I use REAPER as my DAW, it is fully supported by Source Connect. We successfully tested the remote control video sync playback for dubbing. Speaking of dubbing, that’s part of the reason why I’m going with Source Connect for voice over and no longer subscribe to ipDTL. I love ipDTL, and it’s a fantastic tool for podcasting and broadcasting. But, it doesn’t have video playback for dubbing/ADR. I paid for the full package for ipDTL, including the dedicated Los Angeles ISDN number, and none of my clients wanted to use it. In fact, my European clients who had both ipDTL and the similar SessionLink Pro were using the latter exclusively over ipDTL. They found their SessionLink Pro connections to be better and of higher quality with fewer artifacts, and we could do video playback with it. This brought me back to a core value: providing the right tools for my clients. If a client wants to do an ipDTL session and they own a subscription, I can still log into their session. But choice isn’t mine as the voice over talent. Over the years, I managed to encourage a few corporate clients to try ipDTL; but in general they are not interested. Lately, they prefer to use Go To Meeting or Skype for Business because most of these projects require conference calls hosted in an office, not in a production studio. ipDTL confused too many of my corporate clients. Podcasters and broadcasters understand it, but not business people. It took me an hour once to show a video game producer in the UK how to set up her laptop for ipDTL. And on top of that, the Opus Codec on which ipDTL runs is highly unreliable on Windows 10 for a substantial number of users. Note that on September 18, 2018 they launched a big update of Opus Codec which hopefully fixes many issues. 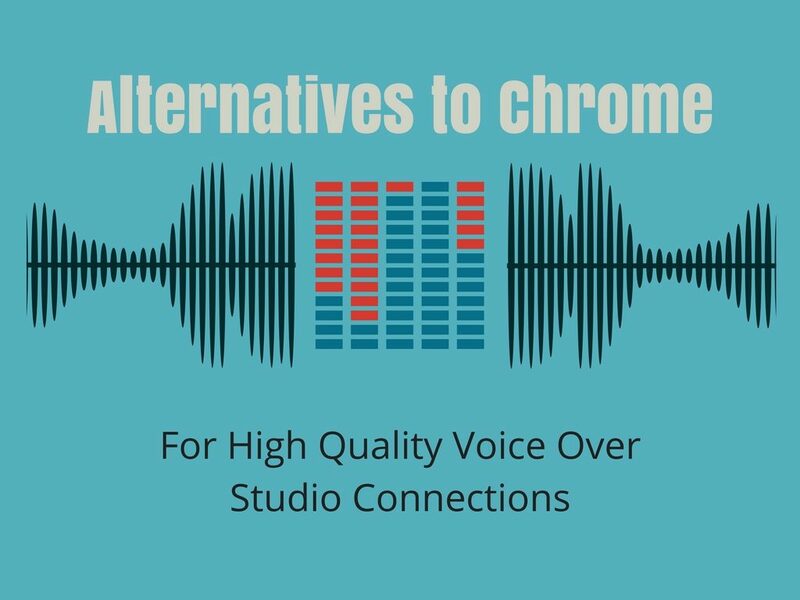 Check my previous post on alternatives to Chrome for Opus Codec streaming. I realized that my Corporate, E-Learning, and Explainer Video clients don’t need ipDTL at all. My studio is covered for them with phone patch or Skype, Go To Meeting, and so on. But for commercial, animation, and dubbing, I need the right tools. Those tools are ISDN and Source Connect. Major American production studios have adopted Source Connect; and accept them going through their firewalls, which is not the case with Opus Codec solutions. As for ISDN, I have access to many nearby Atlanta recording studios for ISDN sessions. From my own studio, I’m happy to offer Source Connect for voice over. 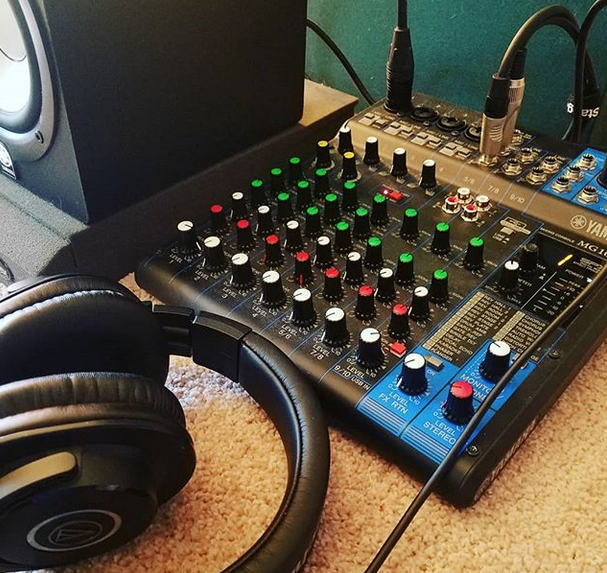 An added bonus I can offer for live sessions is with my Yamaha MG10XU USB mixer, I can playback takes on demand whether using Source Connect, ipDTL, or SessionLink Pro. It’s all about having the best tools for my clients. When you book me for your voice over project, you are hiring my voice and talent: but also my expertise and training. And along with that, you are hiring me for my time, often including a built in rate for editing the voice over audio sessions into video edit-ready sound files. But you are also hiring me for my voice over studio equipment. Let’s go through the signal chain of my studio, from my voice to your ear. 1.) First, I am using a new Rode NT1 large diaphragm condenser microphone with 4.5 dBA self noise. Love it more than the TLM-103 or the CAD E100S I used to own! 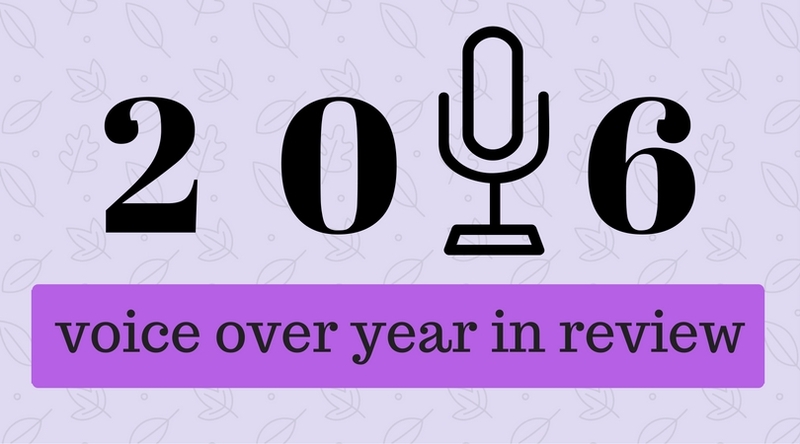 Great for voicing everything from videogames to e-learning. For my travel rig, I use a Rode NTG3 microphone. It has the same sound as a Sennheiser MKH 416, but with a little more response around 100-200 Hz. It has the same self noise of 13 dBA : but in practice the self-noise is lower because the Rode has a significantly louder output. So you don’t need to crank up the gain to get a full, clean signal that cuts through the mix but isn’t brittle. Perfect for voice over. 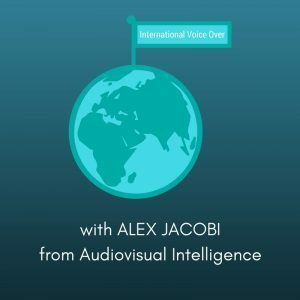 I leant out my microphone to the VO Atlanta Conference remote recording booth while I attended and the talents and engineer George Whittam were very pleased with it. 2.) Next in the chain of my voice over studio equipment, my mic is plugged into high quality Mogami Gold XLR cables and mounted with a strong and quiet Rode PSA1 Boom Arm. It’s true that you don’t need massively expensive XLR cables, but the quality ones like Mogami, ProCo, and Canare do sound better than the cheap ones and have higher shielding coverage. 3.) From there, the cable runs to my Yamaha MG10XU mixer with nice clean preamps in them. All I have to do to play back any audio down the line during a remotely directed session is just call up stereo fader 9/10! But don’t forget that everything should have clean, reliable power. That’s why everything in my studio is powered with M-8×2 power conditioners plugged into Liebert UPC Battery Backup / Surge Protector units. I recommend the Liebert models over APC. 4.) The Focusrite interfaces then connects to my brand new iMac. Yes, after 12 years in the voice over business I’ve switched from a PC to a Mac! The final straw was that Windows 10 is simply incompatible with modern audio streaming services. A Mac is fool proof when working with drivers and streaming products. The iMac is silent, even though I record in a separate booth with a tablet and script stand. I didn’t go for a laptop as I prefer to have the larger 21″ screen for editing. I can still record on my PC laptop on the road. But I’m home at my studio with my voice over studio equipment nearly year round, even during holidays! 5.) Inside the iMac is my new favorite tool: the REAPER DAW. 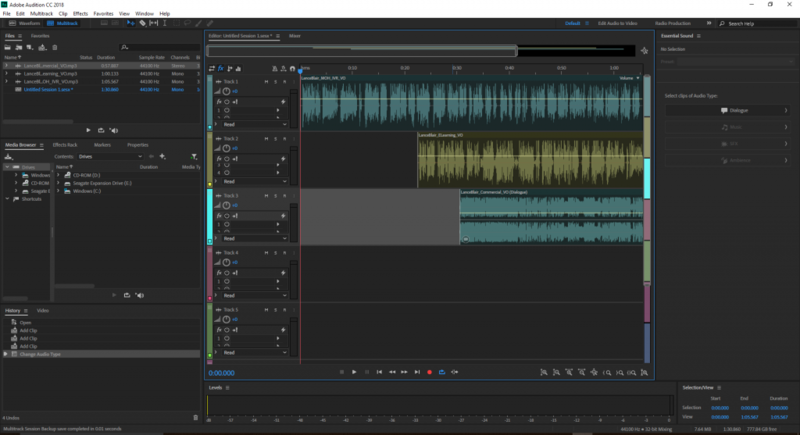 I’ve ditched my Adobe Audition Creative Cloud subscription, and REAPER can do so much more. What’s it like? Check out this video showing my open source customized REAPER skin. Amazingly, this video was edited and exported using REAPER without the use of any video editing tools. It’s that powerful. And it costs about the same as one year subscription to Audition Creative Cloud, but then you’re not renting it. You own it! To get the most out of my DAW, I record at 48 kHz 24 bit, no matter what the final file resolution is. Always the best quality for source material! 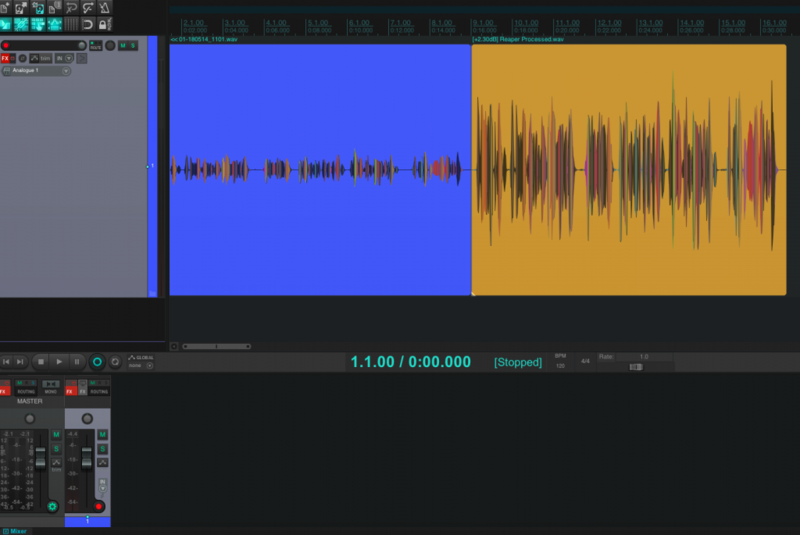 If you’re a corporate or E Learning producer with limited audio editing and processing capabilities, I can process the files for you using my suite of plugins to give you nice, gently processed, ready to publish audio with -3dBFS peaks. 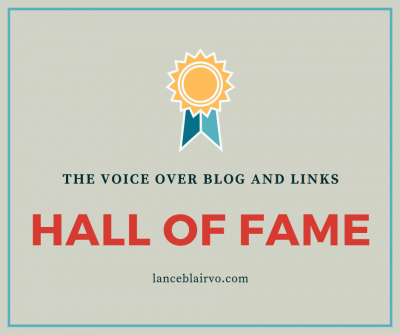 I was an audio engineer for film and broadcast years before I was a voice talent, so you can trust me on this! 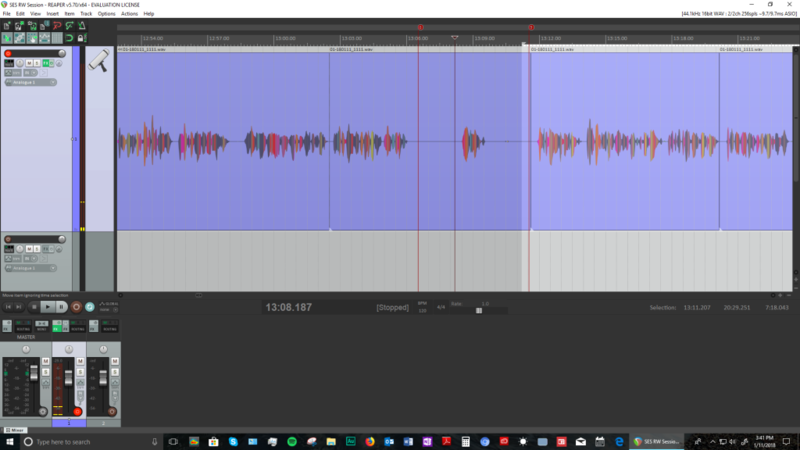 In the video below, I have recorded audio as-is in blue, and then the following yellow section is the same audio fully processed. Voice Over Recording and Editing with REAPER from Lance Blair Voice Over on Vimeo. You can connect with me on Source Connect, Skype, or phone patch. And I’m experienced with connecting to studios that have ipDTL or SessionLinkPro. After the recording is done, I proof everything listening to my Yamaha HS50M monitors or Sennheiser HD280 headphones. When you hire me, you are getting my voice, training, time, experience, and my voice over studio equipment. All having the highest quality. My goal is always quick turnaround, and lasting results.